Introduction from Michael: I asked Dee to tell people how she helps to protect feral cats when they are being fed and TNR’d. I asked because we know there are quite a lot of people who like to kill feral cats. Caretaking feral cats is a commitment that I take seriously. There is so much more to it than feeding and TNR (trap-neuter-return). They require protection. It’s said that the only beings that kill without provocation are man and sharks. It’s frightening that humans want to kill cats, but it’s reality. Count them, really look at them, watch how they interact, pick up on out of character behaviors etc..
Scan the environment for signs of intrusion – that bucket on its side with standing water in it or that empty cat food can that was never there before didn’t just “blow in”. If you sense something is wrong, it probably is. Change routines periodically – feed and show up at different times. Patterns to abusers are the same as bank blueprints to a robber. If there is imminent danger, you can always move your colony to a safer place. This is very hard and I have only helped with one of these 4 years ago. You will need help. This entry was posted in cat haters, cat welfare, Feral Cats, Human to cat relationship, human to human relationship, Injury, killed, saving lives and tagged cat killing, killing a feral cat, killing cats, trap neuter return by Michael Broad. Bookmark the permalink. I loved this blog like I love all original ones and it must be a worry caring for ferals when cruel people are about. I think this is the first page on the internet on this particular subject. I have never seen anything like it. Good on Dee. I’m full of respect for you too Dee, it’s a full time job caring for a colony what with the physical work and mental stress of worrying about their safety. There is always someone evil wanting to do harm as has just been proved further up the page by yet another Woody clone. I help to run one of the more popular feral cat websites online. We use it to collect information on where everyone keeps and and how they hide their colonies. Then we disseminate that information to those that will help step-up the rate of that colony’s “attrition”, so TNR works faster, so we can then finally claim that TNR actually works. We also encourage other more ecologically responsible people to volunteer for TNR programs and befriend anyone who practices in TNR so we can later go back and reduce their cat-populations the right way, the way it should have been done to begin with. How do you protect your cats from these methods? Could you give me the URL of your feral cat website? I think it’s “www. brainsofwoodchips.com”, Michael. No rational caretaker would disclose the location of their colony on a website, Woody. He can’t seem to get that his “quick change artist” vocation isn’t working for him here. He is always apparent. I guess he’s not motivated to find his own niche somewhere with those of like mentalities. Agreed! What is interesting is that he is trying to be polite (by his standards) whereas in the past he just swore all the time (you have not seen his original comments because I deleted them). He has been banned from every website. My opinion is that “our Woody” hangs out here a lot with us. He knows each of us and likes us. I don’t really mind anymore as long as he is civil. I, actually, did see some of his raw comments before you deleted them. I agree that he is tolerable now. We may make a human out of him after all! I have so much respect for you Dee. Thank goodness there are people like you and the others at POC. Managing a colony must be both rewarding with moments of pleasure, balanced by the stress of the unknown. It is like walking a thin line between giving cats the freedom to live their lives, and the need to protect them. I wish for you more joy than sorrow and continued good health to the cats you care for. DW, I think it is tough looking after a feral cat colony. There are a lot of obstacles. And the responsibility. The worry etc..
Feral colonies are a true joy to me. I feel privileged to have entry into their special world. To be a part of helping some descend from true feral to feral, feral to semi-feral…makes me so happy. When a feral puts his paw on my ankle of calf when my back is turned, I light up because, in all probability, he was hissing and spitting at me last year. No drink or drug could be better than the “highs” I get from those cats. When a cat connects with you he becomes domestic for a while. He is where he belongs. All feral cats should be domestic cats. They are missing out on what they should be. Well done Dee, and thanks for the article. Dee you must write more for us about your ferals, I loved the bit you wrote which I’ve quoted above, it touched me deeply. Yes, for me it is a sign of a feral cat coming in from the cold, tasting domestic cat life and Dee is doing the work. Feral cats should be domestic cats. Many will never transition to domestic because they won’t have the time. Young cats are pretty easy. Some of the semi-ferals I’ve brought in (that’s the stage to get them out of the colony) are difficult because they are “middle aged” now. They’re manageable, but may never completely trust. I’m happy that they allow petting and brushing. I try not to dwell on what these cats have had to endure in their lives and just focus on giving them better and the best of me. A long time ago I wrote a page on taming feral cats. I don’t know how good it is but I think it is not bad. I, actually, read this article and liked it. It’s very factual (a couple of small flaws) and clinical. Sorry, but it lacked heart; it’s a hard subject to capture without having had hands on experience. Yes, for that moment, he felt safe. Brilliant advice Dee, I love your article! Cats Protection never disclose the position of colonies here because of people who would hurt them. But a friend Joan who lives around 10 miles from us, has horses in a stable and field and she took in 2 feral cats who were in danger elsewhere, had them neutered and cared for them. The field isn’t far from where she lives and there are other people with stables there too, the cats were happy living the life ferals like to live. But last year she found one of her cats dead, she had been shot. The police and RSPCA couldn’t find out who had done it, some cruel yob out after rabbits probably. Bad enough, but then the other week she found her other feral had been killed by dogs. Someone had seen 2 yobs in the field setting 3 lurchers on to him and had chased them, but it was too late. The police and RSPCA have a description from her so hopefully they may be caught although so far they haven’t. So you see it’s almost as bad here in the UK for ferals as it is there despite our animal welfare law, there are cruel people everywhere! Now Joan can never risk giving a home to any more ferals who need relocating. It’s broken her heart. It must be very stressful for you Dee trying to keep yours safe, I admire you very much! God, what a horrible little story of Britain. You’re right, Ruth, there are a lot of nasty idiots who want to hurt cats and the feral or stray cat is right there in their sights. So vulnerable. I would love to see some change in this area because of all the topics we write about, the feral cat problem and their vulnerability is pretty high on the list of the most discussed. Yes it is horrible Michael. Bad it is in our town because of druggies and criminals, our immediate neighbourhood is cat friendly and of course we are ever vigilant when new people move here until we know them. It’s all we cat lovers can do, look out for the welfare and safety of all cats as far as we can, but it’s never enough. We are on our own pretty much and Dee’s article supports that fact. She knows she has to protect her feral cats because no one else will and the police won’t be interested. It does put pressure on decent people who are concerned. We feel abandoned by the authorities. If something happened to one of the cats where I live now (i.e. abused and hurt), I don’t think I’d bother to call the police or RSPCA, which is a bit sad. I might call the RSPCA. But the police; no. Yes you have to call the RSPCA and give them a chance to help, some of the Inspectors really do their best against all the odds, the two who took the Conwoman’s hidden neglected cats away were very kind to them and they got her to Court for that and fined and banned for 2 years. She got away with only a suspended sentence for robbing her friends and businesses, even though her crimes go back to the 1980s! I think it’s worth calling the police too, ours always say even if they can’t do anything they log the call and incident to build up a picture for future incidents. Again there are some police who do a wonderful job under very difficult circumstances, they are limited by rules and regulations though. But we are lucky here with our neighbourhood police I know. There are monsters everywhere, R.
We just took in a cat with a clipped ear who was neutered but has FIV. We took him in because he is a kitten and it was freezing out. In Slovenia, we have been told, they NEVER EVER kill healthy animals or animals with FIV. They don’t kill. They TNR and they don’t even have a big feral population. Im impressed with that country – it’s a small very poor country so I they deserve a medal for being good people. FIV is tricky because if vaccinated against it they show up positive. In Slovenia they don’t vaccinate against FIV because it means a kitten who is a carrier but will lose it can then never lose it and anyway they say the vaccine doesn’t work because there are too many strains of the virus and they cant vaccinate for all of them. We have the issue of there being 4 non FIV cats in the house and one FIV kitten now. Hi Marc. Nice and informative comment. Thank you. I have holidayed in Slovenia about ten years ago. I was impressed with the country. We stayed near Lake Bled. I felt it would be a good place to live. It is nice to know they treat feral cats well. It fits in with my impression of the place. Good point about not telling anyone except your secondary person as to location of the colony. There are several colony caregivers that I’ve accidentally run into at the supermarket or vet. It’s amazing how they keep up. My daughter examines our cats daily. She knows when something is wrong with a cat before any symptoms that are life threatening show up. I’ve made many a vet visit before work because something was “off” with one of the cats. Elisa, Nice avatar. Well done! 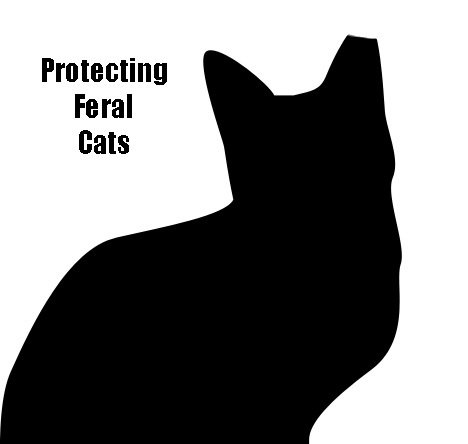 Although I like Dee’s advice on protecting feral cat colonies, it is a bit sad that she has to outsmart the cat haters and killers.